With these ten heart-rending lyric poems, Peter Solis Nery establishes himself as the pre-eminent Prince of Ngoyngoy Poetry in Western Visayas. I know that the first nine poems in this volume were written almost a decade ago in response to a competition. As a challenge, I asked Peter to compose, on the spot, the tenth poem for this collection, using a munggo bean for inspiration. The prize was the free printing of this book. At an amazing speed of 29 minutes, Peter produced Ang Gugma nga daw Munggo [Love like a Mung Bean], agood rival to any of his nine earliest Hiligaynon lyric poems. In short, he won the bet. The Prince of Ngoyngoy can write. I am convinced that this collection is a true Ilonggo treasure from the exciting Ilonggo poet who gave us such lyrical collections as: Fireflies for a Yuppie: Poems of Love and longing from a Country where Autumn Leaves do not Fall, and A Loneliness Greater than Love. 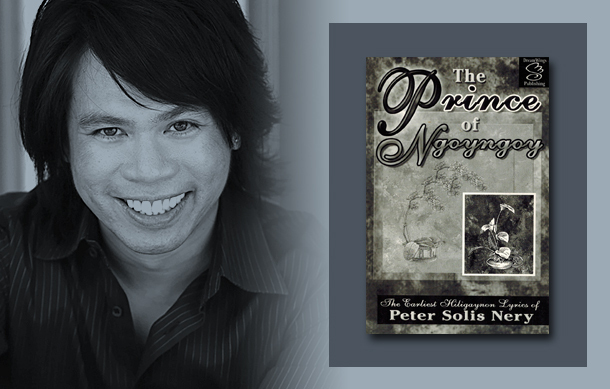 Like his English lyrics, Peter Solis Nery’s The Prince of Ngoyngoy collection awakens the world of invisible spirits to deep feeling. By expressing that which he feels in terms of all that he sees and hears in the provincial Dumangas where he grew up, he effortlessly moves heaven and earth. In doing so, he reminds us that to love, and to be human, is to be haunted. I am proud to finance the publication of this very worthy Ilonggo poetry book. © Peter Solis Nery 2014. All Rights Reserved.